I love finding out about new independent brands who I haven't shopped with before, so when Manchester based fashion retailer Luxemme contacted me for a review of one of their limited addition pieces, I was more than happy to accept and check out their brand. After a browse on their online store I decided to pick the Olivia White Lace Two Piece co-ord priced at just £35 for both the skirt and top. I always love to get plenty of wear out of my clothes, especially styling them for different occasions, so here are 3 different looks I created with the two piece. For the first look I kept in simple with a classic black and white outfit, adding a monochrome bag from New Look (£9.99) and some black strappy New Look heels (£24.99). Perfect for heading into town for the night. For the second outfit I wanted to go for a more professional looking style so I added a smart pink jacket and some matching pink Asos heels (£30 but now reduced to £21! ), plus a white bag and simple gold curve necklace to finish the look. The third look I put together is a more casual style, using neutral earthy accessories such as the dark green fedora hat (£24.99 Topshop), the brown fringed duffle bag (£17.99 New Look) & the orange/brown cardi. I think this would actually be a really good festival look (if you swapped the heels for some wellies of course!). It's amazing what a completely different style and look you can get just from changing accessories, a simple jacket or shoe change can really make all the difference. Now you've seen how the two piece looks here's what I thought about the details. I'm usually a size 8-10 in clothes, often being smaller on top and bigger on skirts/trousers. I ordered a size 10 in the skirt which was a perfect fit, and an 8 in the top. I think for any future purchases I'll probably order a 10 in both as I was lacking in space a bit up top for the ladies! Every retailer is different though, it's just about getting to know a brands sizing. I'll be honest I wasn't sure what to expect for a two piece of only £35, sometimes you accept that more budget clothes will be lacking on quality, however I was actually pleasantly surprised with the Luxemme co-ord. The material wasn't flimsy at all, it's even been through the wash and not had any issues with bits of threads coming apart etc. It's also not see-through which I always think is a bonus with white pieces! I definitely now feel like Luxemme have my trust as a brand who I can rely on to buy good quality and very reasonably priced clothing from. I'm 5 long days away from payday but I've already got my eye on a gorgeous pastel blue skirt on their website which will hopefully make it's way into my wardrobe very soon! Have you purchased anything from Luxemme before? Would love to know your thoughts on the brand. I love all the looks Gabby! My favourite has to be the third one though as the cardigan is just gorgeous! Perfect for A/W! Thanks so much Charlotte! I'm edging my way into A/W now (even though it's only August noooo). Love this! My fave is the last one, super boho looking! The second look is my favourite!!! Love all of it! I love how you have styled the co-ord. The last look is my favourite. The brand sounds incredibly promising; affordable price and quality piece? That's a win right there! All the looks you've styled here are so pretty, but look 3 HAS to be my favourite! You're beautiful! I love how you transformed this dress into completely different styles! Your outfits are always on point :) My favorite is the boho-inspired look with the fringe bag and long cardigan! Love the three options, it's amazing how you can go from a really classy and chic look to a boho one! 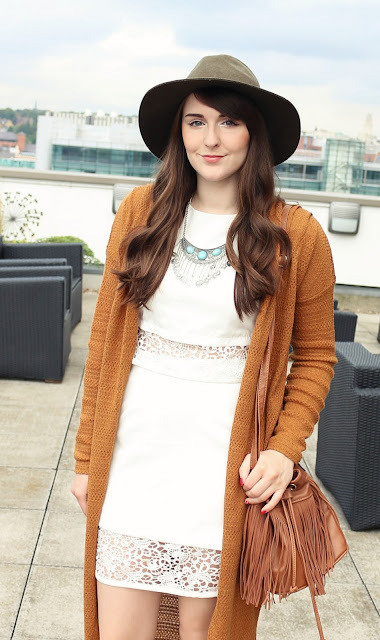 Love how you've styled your co-ord girl! I've just shot my collab with Luxemme today :) Love their pieces! The quality of the pieces were a pleasant surprise I must say! Oh my gosh gabby that dress is beautiful! So pretty and sophisticstedM I love the pink jacket for the office too - plus you look so beautiful!